This Japanese style recipe takes just 30 mins to make and is perfect for vegetarians, vegans, and omnivores alike. 1. For the dressing, put the soy sauce, vinegar, miso, sesame oil, maple syrup and ginger in a jar. Screw on the lid and shake well to combine; set aside. 2. Put the garlic and 1 tbsp vegetable oil in a frying pan set over a medium heat. When the garlic is just golden, add the broccoli and coat in the oil. Add 5 tbsp (75ml) cold water; stir-fry for 5-6 minutes until the water has bubbled off and the broccoli is tender (add more water and cook for longer if the broccoli spears are thick). 3. Meanwhile, drain the tofu well on kitchen paper; cut into 1cm-thick slices. 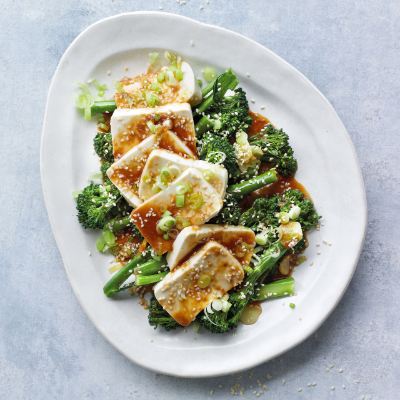 Tip the broccoli onto a serving plate and top with the tofu slices. Spoon over ½ the dressing, then scatter with the salad onion and sesame seeds. 4. Heat the remaining 1 tbsp oil in a small pan over a high heat until smoking, then pour over to wilt the salad onions slightly. Serve with rice or noodles, if liked.